Product prices and availability are accurate as of 2019-04-26 07:53:29 EDT and are subject to change. Any price and availability information displayed on http://www.amazon.com/ at the time of purchase will apply to the purchase of this product. Use with USB powered devices, 12V and AC powered devices. 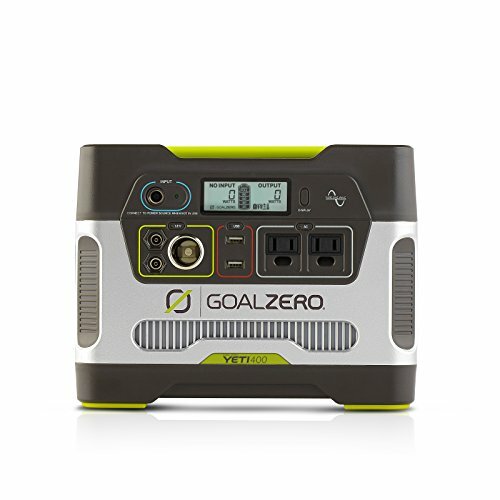 The Goal Zero Yeti 400 is best used with your tablet, laptop and TV. Easy to carry; convenient pop-up handle. Charging flexibility; refuel from wall, car or sun. Battery material: lead acid. 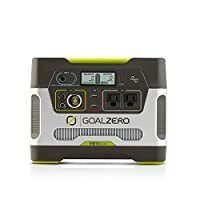 Included with a Goal Zero Yeti 400 purchase is a 4.7 mm to 8 mm adapter. Battery Capacity: 400Wh, 33Ah (12V). Power Output: USB (2x), 12V, AC (2x) . Recharge by: AC, 12V, Solar .